Bostic makes use of a wide range of materials including stiffened tissues, cotton, tulle, glass, wood panels, pigment, oil paints, wax, oil pastels, dental floss, plastic vinyl, bubble wrap, baby wipes, coffee grounds, twine, wire, with techniques such as fibre stiffening, encaustic, double weave and screen printing. Colours are often natural, or stained with coffee, or perhaps the colour of dried blood. As a weaver I was drawn to a number of works using double weave – seen in a photograph of Bostic’s undergraduate exhibition (http://www.worldofthreadsfestival.com/artist_interviews/078_megan_bostic_12.html), and in a variety of scales in Stale Hope, seen hung as part of the World of Threads Festival in a photograph on Bostic’s website (https://meganqbostic.squarespace.com/news/). Double weave is very effective in trapping objects, partially obscured, inviting close investigation. However this research section is about surface distortion, and there are two examples of crumpling in Bostic’s work which really take advantage of that technique to evoke the crushing of hope, the wearing down of grief. In Family Portrait Bostic has used facial tissues stiffened with beeswax – the family images formed from the holder of their tears. 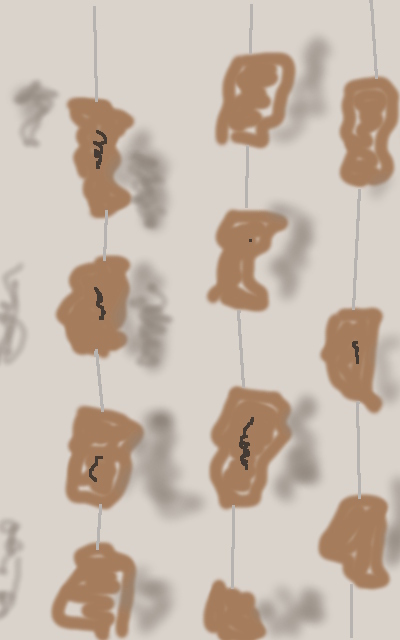 Seven crumpled “heads” are suspended in a group, slightly different heights, sizes, pigmentation. The family resemblance is strong, but each is individual. I thought of a Greek chorus behind their masks, speaking hidden fears, telling their story to the audience. (Images available: http://www.worldofthreadsfestival.com/artist_interviews/078_megan_bostic_12.html and https://meganqbostic.squarespace.com/family-portrait/). The First Year of Grief has columns of waxed rectangles of organza, suspended on linen thread. On the right is my rough sketch of a section, included the very important shadows cast by the days of mourning. Each piece of organza is distorted by crumpling and what looks to be lumpy seams of stitching, like badly healed scar tissue. In these works the materials and techniques are incredibly evocative of the emotions that Bostic is exploring/presenting. It is challenging to see that some of the works were part of her undergraduate show. It’s a reminder to keep pushing, to try to be honest, to take risks, to be ready to expose one’s self. Bostic also shows that the “simple” techniques we are exploring in this part of the course can be very powerful.